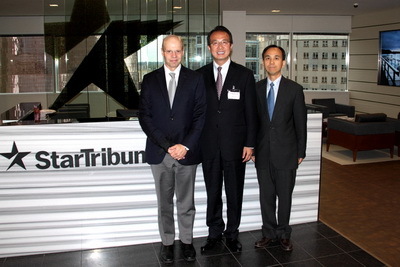 On October 6, Consul General Hong Lei visited the Minnesota Star Tribune in Minneapolis, Minnesota and had a discussion with editorial writer and columnist John Rash. Consul General Hong Lei said that in recent years, China and Minnesota have been deepening cooperation in economy, trade, culture, education and other areas. In 2015, our trade volumn reached US$ 11.8 billion. Over the past 15 years, Chinese companies invested US$ 570 million in Minnesota, creating more than 1,600 jobs. There are currently two Confucius Institutes in Minnesota, assisting American students to learn Chinese. More than 4300 Chinese students are studying in Minnesota universities. They will become an important driving force for Minnesota and China to move closer. Consul General Hong Lei said that China-US relations are one of the most important bilateral relations in the world. Currently, China-US relations have maintained steady development. Earlier this month, President Xi met with President Obama at the G20 Summit in Hangzhou and reached broad consensus on further building a new model of major country relationship between China and the US. Minnesota will have more opportunities to cooperate with China. The two sides can further expand cooperation in areas including agriculture, machinery, medical equipment and finance. Consul General Hong Lei answered questions on China-related topics in US presidential election, the North Korea nuclear issue, China-US trade relations and the South China Sea issue. Mr. Rush welcomed Consul General Hong Lei’s visit to Minnesota. He said that the Star Tribune believes Minnesota’s cooperation with China in economy, trade, culture and other fields is very important. He would like to keep in touch with the Consulate General.